So my neighbor Laura was determined to show me how to celebrate Autumn (as if I had come from a place where it didn't exist); "you've never celebrated autumn?" she said to me earlier today in her haughtiest Massachusetts accent when I asked what you put in cider. Silly me, I was thinkin' alcohol. So tonight we got some pizza and beer, carved pumpkins (she insists mine looks like a pig - though that's after her thinking it was Michael Jackson for most of the night), roasted pumpkin seeds, drank cider, and made caramel apples. That damn apple took me almost 3 hours to eat. But I now feel sufficiently autumned. Stepping back a few days: Friday was my friends Kai and Heinrich's last day visiting from Munich, so my last chance to attempt to make an impression as a tour guide through some of LA. Our main stop of the day was Griffith Observatory, but I knew the views would be best from there after sundown, so I started off downtown at City Hall. One of LA's best kept secrets is the observation deck at the top, which has pretty impressive views in all directions, as well as a pretty impressive interior. I did forget, however, about Kai's fear of heights, so I don't think it was the surprise for him that I was hoping it would be. I do wonder if City Council meetings were held in that top floor room that led to the deck in City Hall's early days. We wandered a little downtown, stopping of course at Gehry's Disney Hall and on to Phillipe's (the originator of the french dip), which they loved. Our next stop was at the Paramount lot - actually an errand to meet up with my friend Kelly and deliver something I had picked up for her in Paris, but it also gave the boys a quick glimpse of a movie lot and their only star sighting of the trip (someone from NCIS). And then it was on to the observatory. It was my first time there since the renovations a few years back; they did a pretty impressive job. The exhibits were great, but it was more about being there. Kai had explained that 'Rebel Without a Cause' had made an impression on him since childhood, so much like being at the Golden Gate Bridge in San Francisco, it was really more about being there than any specific exhibit. 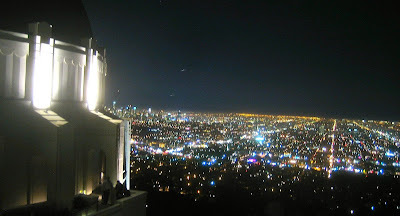 And of course, the view of LA from Griffith Observatory is otherworldy itself. Hopefully it gave them a view to remember for a long time. Today was the annual pumpkin races in Manhattan Beach. I only made it down to the pier for the last few heats and championship, but its always a fun event. 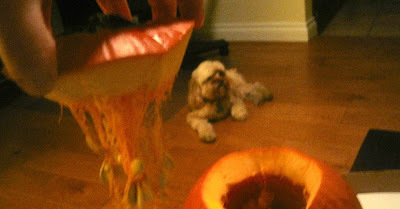 Pumpkins are decorated with all kinda of things, as are a good many of the younger revelers. Pumpkins race in heats down the hill (much like a Pinewood Derby) until the final heats determind the champion. The weather was perfect, and afterward my friend Pat and my neightbor & friend Laura joined me for a fix of Simmzy's, followed by a round of hitting a few watering holes with Laura. On the bike ride home we both said those eternal words "why don't we do this more often?" 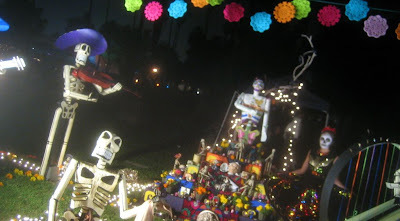 I went with my friends Alan, Jon and Dino to the Dia de los Muertos celebration tonight at Hollywood Forever Cemetery. 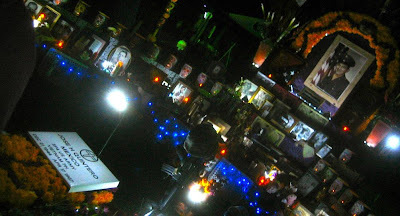 Dia de los Muertos, or Day of the Dead, is a Mexican celebration on November 1 and 2. Why Hollywood Forever had theirs tonight, I have no idea. Traditionally, elaborate shrines are created featuring the favorite things, including even foods and drinks, photos, and items of a deceased person. The legend is that souls of those who have passed are easier to visit the living today, and the shrine is meant to encourage their visit. Hollywood Forever's celebration also featured concerts, food, and even turning the mausoleums into art galleries. Many people come in costume or at least in face paint. Granted, there was certainly something strange about a festival among headstones, but I suppose that's also somehow oddly appropriate. As I mentioned the other day, as many times as I have been to San Francisco, for some reason, I had never been over the Golden Gate Bridge before. I don't know why; it was on the other side of town, it was too hard to get to, it would be too busy, I don't know. But when I was in SF over the weekend, I finally trekked out to the bridge with Kai and Heinrich. It wasn't hard to get to. From where we were in Nob Hill, we just got on the muni bus #1 out to Presidio Park (not Presidio Street) and then transferred to bus #28 which ends at the bridge. Easy. Not only do you get the great views of the bridge up close, but walking out on the bridge also gives you great views of the city and the bay. Sure, its a total touristy thing to do, but it really isn't much of a tourist trap - its just the bridge, not a lot of huckster things or fees to drag you down. Definitely one for the 'worth doing' column.